Korean American seniors joined forces to advocate for the rights of fellow senior citizens to receive Medi-Cal letters in their language of choice. 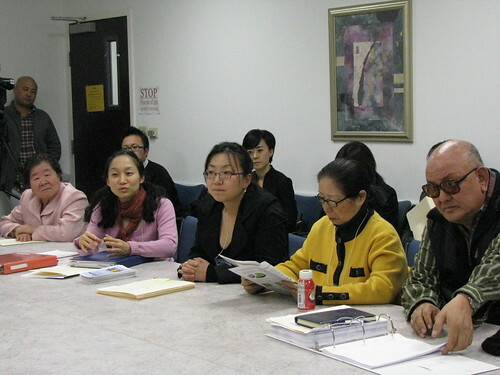 The Korean Resource Center (Executive Director: Dae Joong Yoon) and its Community Health Promoter leaders visited the Los Angeles County Department of Social Services to tell them of the troubles they have to go through because everything from DPSS is only in English, and asked for materials to be provided in the Korean language as well. They delivered 600 signatures in support of their position, and 270 Language Designation Forms (PA-481). Community Health Promoters argued that while Limited English Proficient seniors are filing the PA-481 forms every year, DPSS has always sent Medi-Cal documents in English, not in Korean. Miss Hwang Jin Sean, a 82 years old Los Angeles resident, said "I am studying English, but the English jargon in Medi-Cal documents is too complicated for even someone like me." and pointed out that "at the end, seniors lose, since we cannot do an accurate communication with DPSS." Miss Kyung-Hee Kim, 72 years old, said "I once went to the hospital for a cataract surgery, but they had no Korean interpretation available, and I had to go back home without receiving treatment", and asked "please give us proper language services". To this, DPSS's regional director Lone Price said "I had no opportunity to listen to the voices of the Medi-Cal beneficiaries suffering because of language" and promised "we will seek ways to solve this issue through constant communication and gathering opinions from the community." The Korean Resource Center and Community Health Promoters plan on continue engaging in dialogue with the DPSS around Medi-Cal language access issues.